This week’s theme is paper crafts, in honor of our paper crafting themed week for National Craft Month! 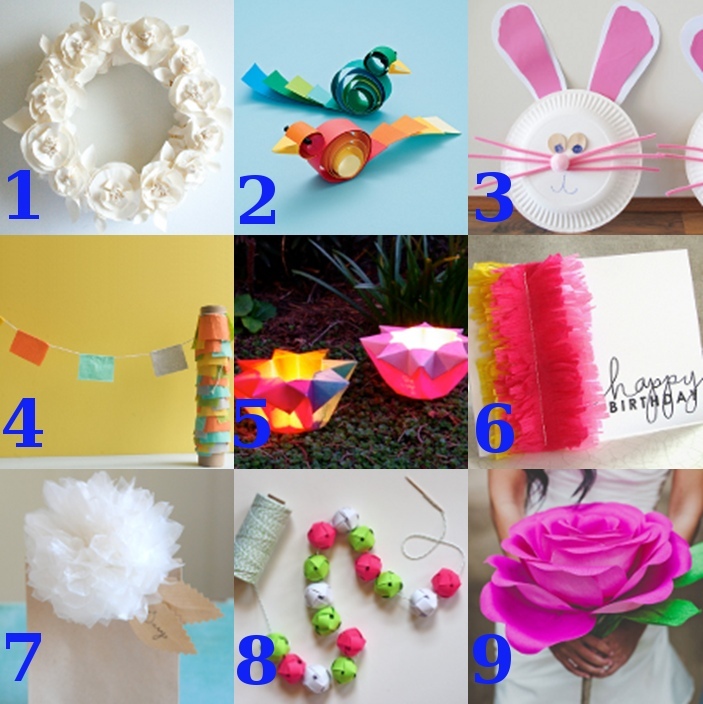 Here are some great crafts that you can make with paper. If you don’t like to make cards or scrapbook layouts, there are tons of other things you can make with paper instead! 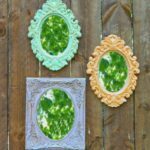 Don’t let its two-dimensional property keep your creativity at bay–you can make all sorts of three-dimensional things out of paper, such as wreaths, faux flowers, and party decorations. 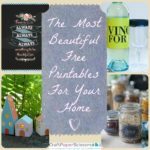 If you’re on a budget, paper and a little craftiness are all you need to decorate your home, your wedding, or your party. I know what you’re thinking – it’s February, why are we talking about Christmas right now? On one hand, I get it. Why look ahead (or look back) when there are so many holidays and activities between now and December 25th. On the other hand, I think this logic is a little flawed. There’s a reason it’s called the most wonderful time of the year. No matter where you are and what you believe in, the Christmas season is positively magical. Why not keep that spirit going all year long? 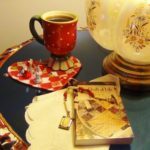 Luckily, we’ve got you covered with the latest eBook from AllFreeChristmasCrafts. 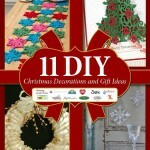 In “How to Make Ornaments: 10 Christmas Ornaments to Make” eBook, you’ll find all kinds of craft ideas to give the holiday spirit going all year long. 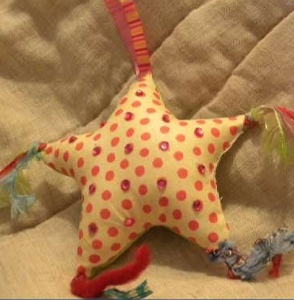 Each of these projects can be created at home with easy-to-find materials. You can even round up the kids for many of these projects and spend some time together. Christmas ornaments often turn into keepsakes and are often passed down through the generations. Why buy a store-bough piece when you can create something meaningful at home? Snow is the true sign that winter has arrived. No matter how old you are, you have to admit that when the first snow of the year arrives, it’s a magical feeling. 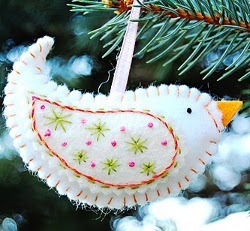 Capture this spirit with help from this uncomplicated ornament craft. All you need is felt, pins and a Styrofoam ball. Attach a ribbon and hang up your creation – it’s that easy. Best of all, you don’t have to be precise or follow a long list of instructions. Just express your creativity and make something that reflects your personality. Yes, the name of this project is intimidating. Paper folding can often be frustrating and complicated. But guess what? There’s very little folding necessary! 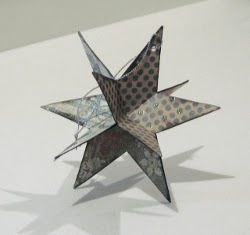 Instead, cut out stars and adhere them together, all you have to do is bend the paper to create the shape. It doesn’t get much easier. Choose paper that sticks out on your tree so everyone can spot your creation. 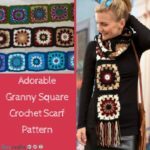 This is one of the most popular patterns on the site and it’s easy to see why. This project is whimsical and adorable. Also, you don’t need a sewing machine to complete this project. Grab some felt, a needle and some thread and you’ll be ready to go. Give this ornament as a gift – it looks great all year and is versatile enough to be hung from a doorknob or hook during the year. 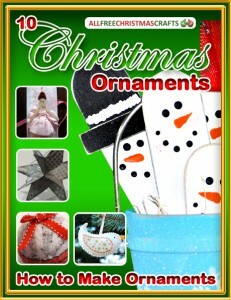 These are just three of the crafts you’ll find in “How to Make Ornaments: 10 Christmas Ornaments to Make” eBook. Download a copy today, it’s free! Today’s Meet and Make designer is Susan Weckesser. Susan is a scrapbooker, painter, writer, and general crafter who runs Susiebee Studios, where she just recently released her scrapbooking paper line. I have sky dived just to say I could even though I am terrified of heights! My father sent me to take flying lessons when I was 15 which was awesome because at that time I was dating the youngest pilot in Canada…..he was 16. I loved tarantulas until my brother lost his for three months in our house. Now I am terrified of all spiders! I almost became a veterinarian until one day I was suppose to be doing surgery; needless to say my path turned back onto the road of writing and art. I have been a guest on Jean Pare’s cooking “Company’s Coming” a couple times and my favorite food is cheese and jam sandwiches. Ok, I like a nice Creme Brulee too! I am addicted to photographs….ask my family. I play ten instruments: oboe, clarinet, bass clarinet, violin, saxophone, tenor saxophone, trumpet, guitar, drums, and piano. My mom calls me Toadie, from the “Wind in the Willows,” and my Hubby calls me Hobbes from “Calvin and Hobbes.” Other people call me Susie or Susan. I acted as an extra in quite a few movies once upon a time, had roles in musicals, and was even a runner up in Miss Teen Edmonton. Ok…that was many lifetimes ago! I love the challenge of taking anything around me and making it into art. My kiddos now love to bring home things like neat sticks, flowers, feathers, or old windows for me to alter. You need to copy, trace and cut out two of the star pattern. You then knot and pin your ribbons to the corners. Sew the good sides of the fabric together using a machine and leaving a 11/2” opening to flip in right side out. After you have done that stuff it up, hand sew the opening and the fun part remains! FaveCrafts 365 Chipboard, Cardboard, and a Little Watercolor Paper! And I guess I should add foam board and mat board in the mix! What the heck is the difference between this one and that one? Just watch the video! You might want to learn a little more about chipboard as it’s part of a very exciting new technique around town! I might have to just do a FaveCrafts 365 dedicated to this new, exciting technique I noticed while shopping at my local craft store the other day! But for now, check out the video! This week’s Meet and Make designer is Julianna Hudgins. 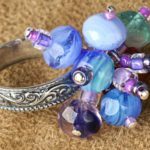 Julianna is a household name in the crafting world because of her numerous TV appearances on QVC, Aleene’s Creative Living, HGTV’s Carol Duvall Show, PBS Scrapbook Memories, and more. 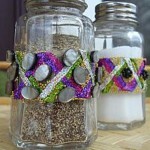 You can find more about her crafting adventures at JuliannaProductions.com. Let’s meet Julianna! Make sure that you protect your area prior to using Luminarte Spray Paints. I used an old pizza box as a spray booth and kept wet wipes on hand to clean up. 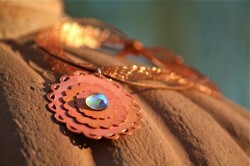 Apply Luminarte Radiant Rain to paper in following order: Ginger Flower, Copper and Egyptian Gold. Let dry. 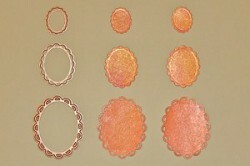 Using Spellbinders Grand Calibur, cut the small, medium and large ovals from paper cutting two of each size. 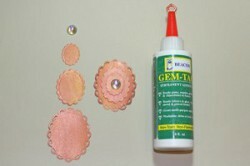 Glue the two layers of each side together back-to-back with Gen-Tac glue, aligning cut edges. This will give each piece more dimension and give each piece a painted front and back. Let dry. 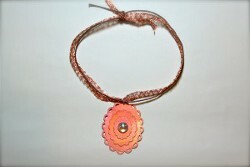 Glue small, medium and large layers together to create pendant. Glue cabochon to center of small oval. Let dry. Carefully open jump ring and loop through top hole of pendant. Close jump ring. String ribbon and cording through jump ring. FaveCrafts 365 Happy National Craft Month! In celebration of March being National Craft Month, we have a Glossy Paper Giveaway in this FaveCrafts 365 v-log post! Just watch the video through the rolling credits to find out how to win. All giveaways are open 2 weeks after original posting and then the giveaway closes, however, this video gives some good tips about glossy paper so check it out! Contest ends March 27, 2011. Good luck! 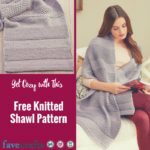 FaveCrafts 365 Retail Therapy, The Craft Way! During my friend Nancee’s recent visit we hit everything creatively retail within 100 miles of my studio! We shopped until we dropped only to get up and craft! Nothing sparks the creative juices like a visit to an art gallery or craft store or upscale home decor shop. And yes, we hit every thrift shop between Vero Beach and Daytona Beach! We were on a mission! A mission from the Craft gods. Check it out! 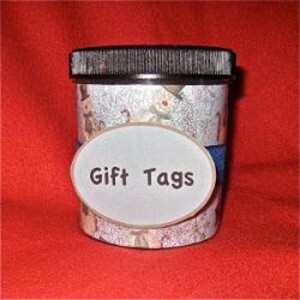 We were successful by the way so look for an upcoming craft project involving… well, you’ll just have to wait and see!